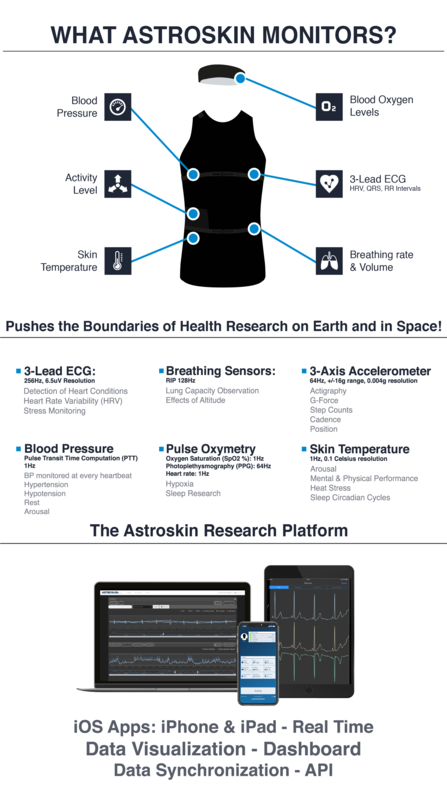 The 19 september, Hexoskin annouced the availability of the Astroskin, a space-grade smart garment aiming to revolutionize the collection of real-world evidence for health research on Earth and in Space! The Astroskin system is based on the Bio-Monitor designed for the Canadian Space Agency (CSA) to monitor the astronauts’ health in space on the International Space Station(ISS).The Astroskin smart garments are available in a wide range of sizes for men & women. The machine-washable garments include state-of-the-art monitoring of blood pressure, pulse oximetry, 3-lead ECG, respiration, skin temperature, and activity sensors for 48 hours of continuous real-time monitoring. The end-to-end system includes iOS apps for iPhones & iPads, data synchronization software, and a web dashboard. Hexoskin provides custom software, data hosting, data science & AI services to suit the most stringent requirements of any organization.